The Dlk1 and Gtl2 genes define a region of mouse chromosome 12 that is subject to genomic imprinting, the parental allele-specific expression of a gene. Although imprinted genes play important roles in growth and development, the mechanisms by which imprinting is established and maintained are poorly understood. Differentially methylated regions (DMRs), which carry methylation on only one parental allele, are involved in imprinting control at many loci. The Dlk1-Gtl2 region contains three known DMRs, the Dlk1 DMR in the 3' region of Dlk1, the intergenic DMR 15 kb upstream of Gtl2, and the Gtl2 DMR at the Gtl2 promoter. Three mouse models are analyzed here that provide new information about the regulation of Dlk1-Gtl2 imprinting. 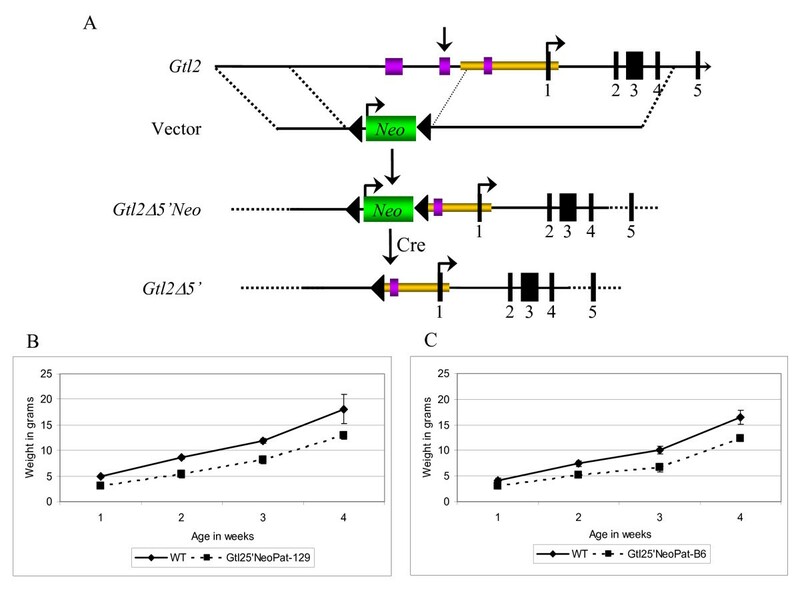 A previously existing insertional mutation (Gtl2lacZ), and a targeted deletion in which the Gtl2 upstream region was replaced by a Neo cassette (Gtl2Δ5'Neo), display partial lethality and dwarfism upon paternal inheritance. Molecular characterization shows that both mutations cause loss of imprinting and changes in expression of the Dlk1, Gtl2 and Meg8/Rian genes. Dlk1 levels are decreased upon paternal inheritance of either mutation, suggesting Dlk1 may be causative for the lethality and dwarfism. Loss of imprinting on the paternal chromosome in both Gtl2lacZ and Gtl2Δ5'Neo mice is accompanied by the loss of paternal-specific Gtl2 DMR methylation, while maternal loss of imprinting suggests a previously unknown regulatory role for the maternal Gtl2 DMR. Unexpectedly, when the Neo gene is excised, Gtl2Δ5' animals are of normal size, imprinting is unchanged and the Gtl2 DMR is properly methylated. The exogenous DNA sequences integrated upstream of Gtl2 are therefore responsible for the growth and imprinting effects. These data provide further evidence for the coregulation of the imprinted Dlk1 and Gtl2 genes, and support a role for Dlk1 as an important neonatal growth factor. The ability of the Gtl2lacZ and Gtl2Δ5'Neo mutations to cause long-range changes in imprinting and gene expression suggest that regional imprinting regulatory elements may lie in proximity to the integration site. The paternally expressed Delta-like 1 (Dlk1) and maternally expressed Gene-trap locus 2 (Gtl2) genes lie within an imprinted gene cluster on distal mouse chromosome 12 [1–5]. This gene cluster spans 1 Mb of DNA, and contains several linked imprinted genes (Fig. 1A). In addition to Dlk1 and Gtl2, these include the paternally expressed Dio3 and Peg11/Rtl1 genes, and the maternally expressed αPeg11/αRtl1, Meg8/Rian and Mirg genes [6–13]. The Dlk1 gene produces a Notch family transmembrane protein, and the Dio3 gene produces an enzyme involved in thyroid hormone metabolism. Peg11/Rtl1 is a retrotransposon-like gene, αPeg11/αRtl1 and Mirg produce multiple miRNAs and the Meg8/Rian gene produces a series of C/D snoRNAs [10, 11, 14, 15]. Such clustering of imprinted genes is common, and is believed to indicate coordinate regulation of multiple genes. Dlk1 - Gtl2 domain and Gtl2lacZ integration. A) Schematic of the Dlk1-Gtl2 imprinted domain. Maternally expressed genes are shown in pink and paternally expressed genes in blue; the direction of their transcription is indicated. Black lollipops indicate the positions of the three known Dlk1-Gtl2 DMRs, which have been designated with individual letters, D, Dlk1 DMR, I, IG DMR, and G, Gtl2 DMR. The dotted arrow indicates a genomic region that produces multiple miRNAs and snoRNAs; emerging evidence suggests contiguous transcription through this region. B) Diagram of the Gtl2lacZ integration. The blue arrows represent the lacZ genes and the green arrows represent the Neo genes. The broken line represents an internal rearrangement that has been refractory to analysis; its size is estimated by Southern blotting. The gold box represents the Gtl2 DMR. C) Growth curves of Gtl2lacZPat129 mice in comparison to wild type littermates (WT, n = 11, Gtl2lacZPat129, n = 3). D) Growth curves of Gtl2lacZPatB 6mice in comparison to wild type littermates (WT, n = 6, Gtl2lacZPatB 6, n = 7). E) Growth curves of Gtl2lacZMat129 mice in comparison to wild type littermates (WT, n = 7, Gtl2lacZMat129, n = 8). F) Growth curves of Gtl2lacZMatB 6mice in comparison to wild type littermates (WT, n = 7, Gtl2lacZMatB 6, n = 8). In all graphs the solid line represents wild type animals and the dashed line represents Gtl2lacZ animals. Many imprinted genes function as regulators of mammalian development, particularly in the control of cell growth and differentiation. These roles are illustrated by loss of imprinting mutations in humans, which frequently result in growth disorders or cancer . There is evidence that Dlk1 is a growth regulator, and the Dlk1 transcript is overexpressed in many human neuroendocrine tumors [17–19]. DLK1 protein has been shown to prevent differentiation of preadipocytes, and to promote the expansion of undifferentiated cell populations in the bone marrow and thymus [20–24]. Mice carrying a targeted mutation of the Dlk1 gene show partial neonatal lethality, and surviving animals are growth retarded and display skeletal and adipose phenotypes . The Gtl2 gene produces a noncoding RNA product of unknown function that is present in many different splice forms. 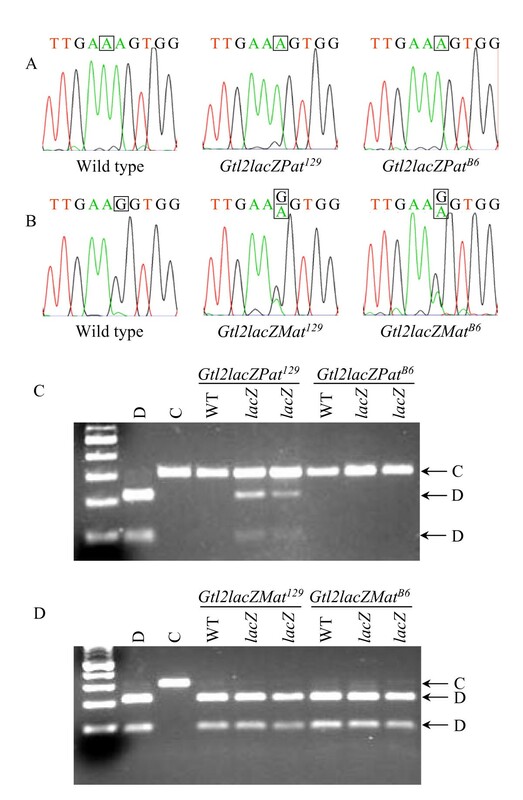 Gtl2 was identified by an insertional mouse mutation, Gtl2lacZ, in which multiple copies of a lacZ-Neo gene trap vector integrated upstream of Gtl2 (Fig. 1B) . Paternal, but not maternal, inheritance of this mutation causes reduced survival and a proportional dwarfism in surviving animals . This phenotype suggests the integration altered the expression and/or imprinting of one or more genes involved in growth regulation, but the Gtl2lacZ mutation has not been characterized at the molecular level. Imprinted genes are commonly accompanied by regions of CpG-rich sequence that carry allele-specific methylation, the methylation of one parental allele but not the other. These differentially methylated regions (DMRs) often contain imprinting regulatory elements for one or more genes. DNA methylation plays an important role in Dlk1-Gtl2 regulation; in DNA methyltransferase deficient (Dnmt1-/-) mice the paternal Dlk1 allele is repressed and the silent allele of Gtl2 is activated . At the Dlk1-Gtl2 locus, three DMRs have been defined, the Dlk1 DMR, in the 3' region of the Dlk1 gene, the intergenic DMR (IG DMR) located 15 kb upstream of Gtl2, and the Gtl2 DMR located across the Gtl2 promoter (Fig. 1A) [1, 28]. These regions are methylated on the paternally inherited allele, although only the IG DMR acquires this methylation in the germline. This suggests the IG DMR may represent the gametic mark for the Dlk1-Gtl2 genes, but it alone cannot explain imprinting within the region. Mice inheriting an IG-DMR deletion maternally show a maternal to paternal epigenotype switch, with overexpression of paternally expressed genes and silencing of maternally expressed genes . This deletion has no effect when inherited paternally, however, so the mechanisms regulating Dlk1-Gtl2 imprinting on the paternal chromosome are unknown. This paper describes the analysis of three mouse models that suggest the Gtl2 DMR may play a role in regulating the imprinting of multiple genes within the Dlk1-Gtl2 domain. The previously generated Gtl2lacZ mutation is shown to alter the expression and imprinting of Dlk1 and Gtl2 on both parental chromosomes. After either paternal or maternal inheritance, the gene(s) that should be silent on the mutant chromosome are activated, and the normally active gene(s) are repressed. To better understand the role of the region disrupted by the Gtl2lacZ integration, a deletion of the integration site was generated by gene targeting. Targeted mice in which the Neomycin resistance gene replaces the Gtl2 upstream region (Gtl2Δ5'Neo allele) phenocopy both the physiological (neonatal lethality and dwarfism) and molecular (loss of imprinting) effects of the Gtl2lacZ integration. Upon paternal inheritance, both the Gtl2lacZ and Gtl2Δ5'Neo mutations cause a loss of Gtl2 DMR methylation on the paternal allele, suggesting this methylation may be involved in maintaining imprinting on the paternal chromosome. The reciprocal loss of imprinting after maternal inheritance also implies a role for the unmethylated maternal Gtl2 upstream region in regulating imprinting on that chromosome. When the Neo gene is removed by Cre-mediated excision (Gtl2Δ5' allele), however, the animals are of normal size, proper imprinting is restored and the allele-specific methylation of the Gtl2 DMR is recovered. The data presented here suggest that 1) the imprinting of genes in the Dlk1-Gtl2 locus is coordinately regulated, 2) this regulation may require the allele-specific methylation of the Gtl2 DMR, 3) the presence of exogenous DNA sequences adjacent to the Gtl2 DMR prevents this methylation, and 4) decreased levels of Dlk1 may be causative for the lethality and dwarfism of the Gtl2lacZ and Gtl2Δ5'Neo paternal mutants. The Gtl2lacZ mouse strain provided a model system to investigate the function and regulation of imprinted genes at the Dlk1-Gtl2 locus. These mice carry a 15-kb integration with 2–3 copies of a promoterless-lacZ/β-actin-Neo transgene upstream of the Gtl2 DMR (Fig. 1B) [26, 30]. The Gtl2lacZ mice were generated on a mixed C57BL/6 (B6) and 129/Sv (129) background. Paternal inheritance of this integration was shown previously to confer reduced survival, and proportional dwarfism of surviving animals, on a 129 background, but a less severe phenotype with no lethality on a mixed (B6 × BALB/c) background . The parental-specific inheritance of the Gtl2lacZ phenotype suggested that this mutation affected the function or regulation of imprinted gene(s) near the integration. Gtl2lacZ mice were obtained on a mixed genetic background, and initial analysis of the animals confirmed the previously reported dwarfism phenotype and the presence of strain-specific modifiers. The offspring of a mixed background Gtl2lacZ male were dwarf when the mother was a 129 female, but were of normal size when the mother was a B6 female (data not shown). In an attempt to generate pure 129 strain Gtl2lacZ mice for analysis, the transgene was introgressed into the 129 background. A separate group of animals was maintained on a mixed B6/129 background by alternating strains at each generation. After only 3–4 backcrosses onto the 129 background, the dwarfism phenotype diminished and then disappeared. Multiple outcrosses to B6 were performed in an attempt to recover the dwarfism, but this was not successful. The Gtl2lacZ animals analyzed in this work are therefore those that were maintained on a mixed background. For analysis of the growth phenotype and gene expression after paternal inheritance, a mixed background male was mated to a 129 or B6 female and the offspring analyzed. For maternal inheritance, a mixed background female was mated to a 129 or B6 male and the offspring analyzed (see Fig. 9 for a detailed breeding schematic). The direction of inheritance of the transgene and the strain of the wild type animal are indicated in the names of the offspring, with "Pat" or "Mat" indicating paternal or maternal inheritance, and the superscripts 129 or B6 indicating the strain of the wild type partner. Breeding strategies for the Gtl2lacZ and Gtl2Δ5'Neo mice. The crosses generated for gene expression and imprinting analysis are detailed. In each cross, the final animals examined for expression/imprinting are indicated at the far right. Analysis of the Gtl2lacZ animals began with characterization of survival and growth after paternal and maternal inheritance of the transgene. Heterozygous animals inheriting the integration paternally (Gtl2lacZPat) and maternally (Gtl2lacZMat) were weighed weekly from 1 to 4 weeks of age. Similar to previously published data , Gtl2lacZPat129 animals showed neonatal lethality, and survivors were smaller than their wild-type littermates at all time points analyzed, weighing 54% of wild type at 4 weeks of age (Fig. 1C). Of 21 individual Gtl2lacZPat129 animals followed, six mice died between one and two weeks of age, a lethality rate of 29% (data not shown). None of the wild type littermates died in this experiment. Gtl2lacZPatB 6mice, however, showed no lethality or weight difference from their wild type littermates (Fig. 1D). For unknown reasons, wild type littermates were also smaller in this cross. Larger litter sizes can result in an overall reduction in pup weight, but the average litter sizes were similar for Gtl2lacZPat129 and Gtl2lacZPatB 6crosses (5.4 and 6.0 pups, respectively). Genetic background therefore has a significant modifying effect on the severity of the Gtl2lacZPat phenotype. Gtl2lacZMat129 and Gtl2lacZMatB 6mice showed no differences in weight from their wild type littermates (Fig. 1E,F). The dwarfism phenotype of Gtl2lacZPat129 animals suggested that the integration altered the expression of a gene involved in growth. Since the integration site is intergenic, it was likely that a cis-acting regulatory element for a nearby gene was disrupted. The position of the Gtl2lacZ transgene had been reported to lie 3 kb upstream of the Gtl2 promoter , but attempts to confirm this position were unsuccessful, suggesting it might be incorrect. A combination of PCR and sequencing was therefore used to map the Gtl2lacZ integration site. Genomic DNA from Gtl2lacZ mice was amplified with the Gtl2lacZ4 and Gtl2trlacZ primers, and the resulting PCR product spans the distal boundary of the transgene insertion. Sequencing of the fragment localized the integration to a position 1659 bp upstream of the Gtl2 transcriptional initiation site (data not shown). As these experiments were in progress, another group also localized the Gtl2lacZ integration to this position . Integration of foreign DNA into the mouse genome is often imprecise, with deletion of endogenous sequences at the integration site. Attempts to identify any deletion upstream of the transgene array were not successful, likely because the repetitive nature of the array complicates PCR analysis. Detailed Southern mapping carried out in the initial Gtl2lacZ report, however, did not detect a deletion . To understand the molecular basis of the Gtl2lacZ phenotype, levels of Dlk1 and Gtl2 mRNAs were assayed by Northern blotting in midgestation Gtl2lacZPat and Gtl2lacZMat embryos. The Dlk1 gene produces a single 1.6 kb transcript by Northern analysis, but the noncoding RNA produced from the Gtl2 gene is alternatively and only partially spliced, resulting in a smear of expression with a few more prominent splice forms. The pattern of these forms varies with developmental stage, but is always similar between littermates. Gtl2 expression was therefore quantified using the intensity of the entire smear, a method that has proven reliable during several studies of Gtl2 expression [1, 29, 32]. Northern blotting of RNA from Gtl2lacZPat129 embryos showed that Dlk1 expression was 52% of the level found in wild type littermates, and Gtl2 expression was 127% of wild type (Fig. 2A,B). No changes in gene expression were observed in Gtl2lacZPatB 6embryos, consistent with the lack of dwarfism in these animals (Fig. 2A,B). Dlk1-Gtl2 levels were also analyzed in the placenta, and showed equivalent changes to those seen in embryo (Fig. 2A). The levels of Gtl2 are low in placenta, however, and quantitation proved difficult, so placental expression was not examined further. Gtl2lacZMat embryos showed changes in gene expression reciprocal to those seen in Gtl2lacZPat, despite the lack of any observable growth phenotype. Gtl2lacZMat129 embryos had Dlk1 levels that were 131% of wild type, and Gtl2 levels 50% of wild type, while Gtl2lacZMatB 6embryos displayed Dlk1 levels 127% of wild type and Gtl2 levels 60% of wild type (Fig. 2C,D) (Table 1). The Gtl2lacZ integration therefore affects the expression of Dlk1-Gtl2 after paternal inheritance only when crossed to 129 mice, but after maternal inheritance when crossed to either 129 or B6 animals. Expression levels of Dlk1 and Gtl2 mRNAs in Gtl2lacZ embryos. A) Representative Northern blots for Dlk1 and Gtl2 RNA levels, in comparison to βactin, in Gtl2lacZPat129 (left) and Gtl2lacZPatB 6(right) embryo and placenta. B) Graphical representation of quantitative expression data for Gtl2lacZPat129 (top) and Gtl2lacZPatB 6(bottom) embryos. In each graph, the black bars represent wild type (the mean of these values was set to 100), and the gray bars represent Gtl2lacZPat, E indicates embryo samples and P indicates placental samples; quantitative data is given for embryo only. P-values are indicated below each graph. (Top graph, Dlk1, WT, n = 3, Gtl2lacZPat129, n = 4; Gtl2, WT, n = 3, Gtl2lacZPat129, n = 4. Bottom graph, Dlk1, WT, n = 4, Gtl2lacZPatB 6, n = 4; Gtl2, WT, n = 4, Gtl2lacZPatB 6, n = 4). C) Representative Northern blots for Dlk1 and Gtl2 RNA levels, in comparison to β-actin, in Gtl2lacZMat129 (left) and Gtl2lacZMatB 6(right) embryos. D) Graphical representation of quantitative expression data for Gtl2lacZMat129 (top) and Gtl2lacZMatB 6(bottom) embryos. In each graph, the black bars represent wild type (the mean of these values was set to 100), and the gray bars represent Gtl2lacZMat. P-values are indicated below each graph. Differences in β-actin levels are the result of analyzing different midgestation embryonic stages. (Top graph, Dlk1, WT, n = 4, Gtl2lacZMat129, n = 4; Gtl2, WT, n = 4, Gtl2lacZMat129, n = 4. Bottom graph, Dlk1, WT, n = 4, Gtl2lacZMatB 6, n = 4; Gtl2, WT, n = 4, Gtl2lacZMatB 6, n = 4). All expression data includes embryos from at least two litters. Summary of Dlk1-Gtl2 expression and imprinting in Gtl2lacZ and Gtl2Δ5'Neo mice. The column "Expression" gives percent change in mRNA levels relative to wild type littermates; "No change" indicates that there is no deviation in expression from wild type. The column "Imprinting" indicates that imprinting is maintained ("No change") or that the silent allele of a given gene is activated ("biallelic"). Increased expression of an imprinted gene results either from increased transcription of the normally active allele of the gene, or from activation of the normally silent allele. Imprinting assays have been described previously for the Dlk1 and Gtl2 genes, based on polymorphisms between the Mus musculus domesticus and Mus musculus castaneus mouse subspecies . Also previously reported is the congenic mouse line B6.CAST-D12Mit30-D12Mit263 (abbreviated Cg12), which carries a M. m. castaneus-derived distal chromosome 12 on a B6 background . Embryos were analyzed at midgestation for the imprinting status of Dlk1 and Gtl2; in these crosses, the M. m. domesticus allele of the Gtl2lacZ animal is abbreviated as "D", and the M. m. castaneus allele of the Cg12 animal is abbreviated as "C". Certain interspecific mouse crosses have been reported to show loss of imprinting in wild type animals [33–35]. In contrast to these systems, however, the Cg12 mice carry only distal chromosome 12 from Cast/Ei, and have been used to analyze over one hundred wild type animals with no loss of imprinting observed [6, 32] (JVS, unpublished data). Gtl2lacZ transgenic animals were crossed to Cg12 mice to assay for imprinting, using a breeding scheme as follows (see Fig. 9). For paternal inheritance, a mixed background male was crossed to a 129 or B6 female, then the male pups from this cross were bred to a Cg12 female and midgestation embryos collected for analysis. To analyze maternal inheritance, a mixed background female was crossed to a 129 or B6 male, then the female pups from this cross bred to a Cg12 male and embryos collected for analysis. The Dlk1 imprinting assay involves RT-PCR amplification of the Dlk1 cDNA, followed by direct sequencing to detect an A to G polymorphism, where the D strain carries an "A" and the C strain carries a "G". In crosses between a Cg12 female and either a Gtl2lacZ129 or Gtl2lacZB 6male, the resulting Gtl2lacZPat129 and Gtl2lacZPatB 6embryos showed the presence of only D RNA, indicating exclusive expression of the paternal Dlk1 allele (Fig. 3A). Dlk1 imprinting is therefore retained in Gtl2lacZPat embryos. In crosses to analyze maternal inheritance, Gtl2lacZMat129 and Gtl2lacZMatB 6embryos expressed both the D and C Dlk1 alleles (Fig. 3B). The increased level of Dlk1 found in these animals therefore results from loss of imprinting, with activation of the normally silent maternal Dlk1 allele. Dlk1 - Gtl2 imprinting analysis in Gtl2lacZ embryos. A) Imprinting assay for Dlk1 in wild type (left), Gtl2lacZPat129 (center) and Gtl2lacZPatB 6(right) embryos. B) Imprinting assay for Dlk1 in wild type (left), Gtl2lacZMat129 (center) and Gtl2lacZMatB 6(right) embryos. The Dlk1 polymorphism is an "A" in D embryos and a "G" in C embryos; the polymorphic base is boxed on each chromatogram. C) Imprinting assay for Gtl2 in Gtl2lacZPat129 and Gtl2lacZPatB 6embryos. D) Imprinting assay for Gtl2 in Gtl2lacZMat129 and Gtl2lacZMatB 6embryos. The Gtl2 polymorphism alters an Sfc I restriction enzyme site, with the site present in D and absent in C; the D and C bands are indicated at the right. The Gtl2 imprinting assay employs a polymorphism between D and C mice that alters an Sfc I restriction site, with the site present in D mice and absent in C mice, so RT-PCR followed by restriction digestion was used to analyze Gtl2 imprinting. Gtl2lacZPat129 embryos showed expression of both the D and C alleles of Gtl2 (Fig. 3C), indicating that the increased level of Gtl2 in these animals results from loss of imprinting, with activation of the normally silent paternal Gtl2 allele. Gtl2lacZPatB 6embryos, however, showed no change in Gtl2 imprinting, consistent with the lack of any change in gene expression in these animals. Gtl2lacZMat129 and Gtl2lacZMatB 6embryos expressed only the D allele, indicating that Gtl2 imprinting is maintained in these animals (Fig. 3D). Gtl2lacZ mice, therefore, show loss of imprinting of the normally silent gene on the chromosome that carries the integration – Dlk1 in Gtl2lacZMat animals and Gtl2 in Gtl2lacZPat129 animals (Table 1). In both cases, the gene that is overexpressed is subject to a loss of imprinting, and the gene that retains imprinting is decreased in expression. The phenotype of the Gtl2lacZ mice suggested that the Gtl2lacZ integration region plays a role in the establishment and/or maintenance of Dlk1-Gtl2 imprinting, and this function was disrupted by the integration. To better define the sequences involved, a targeted deletion was generated that spans the region from -1.3 kb to -4.1 kb relative to the Gtl2 transcriptional initiation site (Fig. 4A). This region was chosen because it contains: 1) two short sequences that are greater than 90% conserved between the mouse, human and sheep genomes, 2) a series of degenerate repeats, sequence elements often found near imprinted genes, and 3) the position of the Gtl2lacZ integration. Importantly, this deletion leaves the Gtl2 gene, Gtl2 promoter and all but 100 bp of the Gtl2 DMR intact. This was important to preserve normal Gtl2 promoter function, to avoid the confounding effect of a Gtl2 deletion. The Gtl2Δ5'Neo targeting vector carried 1.4 kb of sequence upstream of the region to be deleted, and 6.0 kb downstream (Fig. 4A). Following homologous recombination, the deleted region is replaced with the Neomycin resistance gene flanked by loxP sites. Two correctly targeted ES cell clones were microinjected into B6 blastocysts, and both generated high percentage chimeric animals. Male chimeras were bred to B6 females, and one line transmitted the Gtl2Δ5'Neo allele through the germline. Gene targeting of the Gtl2 upstream region. A) Schematic representation of the Gtl2 upstream region and the Gtl2Δ5'Neo and Gtl2Δ5' targeted loci. The targeting event replaces a 2.8-kb region of Gtl2 upstream sequence with the Neo gene (Gtl2Δ5'Neo allele). Cre-mediated excision removes the Neo gene, leaving a single loxP site in the locus (Gtl2Δ5' allele). The black boxes represent the Gtl2 exons (only exons 1–5 are shown), the gold box represents the Gtl2 DMR, the green box represents the Neo gene, the purple boxes represent highly conserved regions across species and the vertical arrow indicates the position of the Gtl2lacZ integration. B) Growth curves of Gtl2Δ5'NeoPat129 mice in comparison to wild type littermates (WT, n = 4, Gtl2Δ5'NeoPat129, n = 8). C) Growth curves of Gtl2Δ5'NeoPatB 6mice in comparison to wild type littermates (WT, n = 11, Gtl2Δ5'NeoPatB 6, n = 5). In all graphs the solid line represents wild type animals and the dashed line represents Gtl2Δ5'Neo animals. 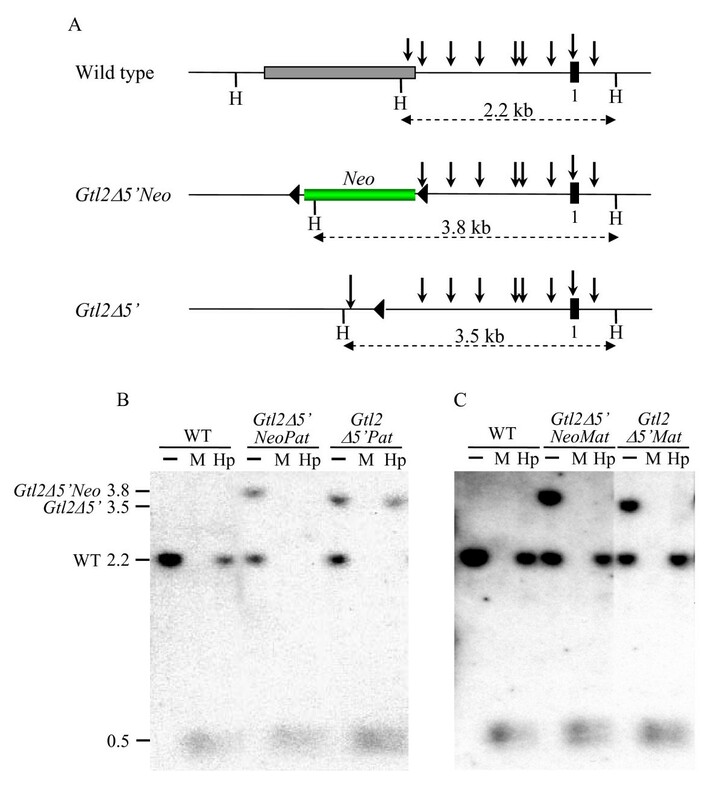 Gtl2Δ5'Neo mice were bred using a strategy similar to that of the Gtl2lacZ mice (see Fig. 9). To assay the effect of paternal inheritance of the mutation, N2 males were crossed to 129 or B6 females and their offspring analyzed for growth and gene expression. To assay maternal inheritance, limiting numbers of Gtl2Δ5'Neo females required a strategy in which N2 females were crossed to 129 or B6 males, and their female pups crossed again to a male of the same strain (129 or B6). The animals analyzed after paternal inheritance were therefore N3 from the chimera, while for maternal inheritance they were N4. As observed in Gtl2lacZ mice, there were strain-specific differences in expressivity of the mutant phenotype. Gtl2Δ5'NeoPat129 mice were fully viable but smaller than their wild type littermates, weighing 72% of wild type at 4 weeks of age (Fig. 4B). In contrast to Gtl2lacZPatB 6, however, Gtl2Δ5'NeoPatB 6mice showed a more severe phenotype, with 50% postnatal lethality by 2 weeks of age. Surviving Gtl2Δ5'NeoPatB 6mice were 75% the size of their wild type littermates at 4 weeks of age (Fig. 4C). Neither Gtl2Δ5'NeoMat129 or Gtl2Δ5'NeoMatB 6mice showed any growth phenotype (data not shown). Northern analysis of Dlk1-Gtl2 expression in Gtl2Δ5'Neo embryos showed alterations that were similar, but not identical, to those observed in the Gtl2lacZ mice. Gtl2Δ5'NeoPat129 embryos had Dlk1 levels that were 60% of wild type littermates, and Gtl2 levels 132% of wild-type, while Gtl2Δ5'NeoPatB 6embryos had Dlk1 levels 35% of wild type, and Gtl2 levels 160% of wild type (Fig. 5A,B). Gtl2Δ5'NeoMat129 embryos displayed Dlk1 levels 108% of wild type, and Gtl2 levels 83% of wild type, while Gtl2Δ5'NeoMatB 6embryos had Dlk1 levels 127% of wild type, and Gtl2 levels 55% of wild-type (Fig. 5C,D) (Table 1). Expression analysis for Dlk1 - Gtl2 mRNA in Gtl2Δ5'Neo embryos. A) Representative Northern blots for Dlk1 and Gtl2 RNA levels, in comparison to β-actin, in Gtl2Δ5'NeoPat129 (left) and Gtl2Δ5'NeoPatB 6(right) embryos. B) Graphical representation of quantitative expression data for Gtl2Δ5'NeoPat129 (top) and Gtl2Δ5'NeoPatB 6(bottom) embryos. In each graph, the black bars represent wild type (the mean of these values was set to 100), and the gray bars represent Gtl2Δ5'NeoPat. P-values are indicated below each graph. (Top graph, Dlk1, WT, n = 4, Gtl2Δ5'NeoPat129, n = 6; Gtl2, WT, n = 4, Gtl2Δ5'NeoPat129, n = 6. Bottom graph, Dlk1, WT, n = 6, Gtl2Δ5'NeoPatB 6, n = 10; Gtl2, WT, n = 6, Gtl2Δ5'NeoPatB 6, n = 10). C) Representative Northern blots for Dlk1 and Gtl2 RNA levels, in comparison to β-actin, in Gtl2Δ5'NeoMat129 (left) and Gtl2Δ5'NeoMatB 6(right) embryos. D) Graphical representation of quantitative expression data for Gtl2Δ5'NeoMat129 (top) and Gtl2Δ5'NeoMatB 6(bottom) embryos. In each graph, the black bars represent wild type (the mean of these values was set to 100), and the gray bars represent Gtl2Δ5'NeoMat. P-values are indicated below each graph. (Top graph, Dlk1, WT, n = 4, Gtl2Δ5'NeoMat129, n = 6; Gtl2, WT, n = 4, Gtl2Δ5'NeoMat129, n = 6. Bottom graph, Dlk1, WT, n = 4, Gtl2Δ5'NeoMatB 6, n = 4; Gtl2, WT, n = 4, Gtl2Δ5'NeoMatB 6, n = 4). For imprinting analysis after paternal inheritance, Gtl2Δ5'Neo N2 males were crossed directly to Cg12 females (see Fig. 9). This is different than the strategy used for Gtl2lacZPat mice, and does not generate data for both 129 and B6 backgrounds, but has the advantage that the animals analyzed for imprinting were the same generation (N3) as those analyzed for gene expression. For imprinting analysis after maternal inheritance, Gtl2Δ5'Neo N2 females were crossed to 129 or B6 males, then their female progeny crossed to Cg12 males and sacrificed for embryo recovery. Imprinting analysis showed that Dlk1 imprinting is maintained in Gtl2Δ5'NeoPat embryos (Fig. 6A). In Gtl2Δ5'NeoMat129 embryos, Dlk1 levels are 108% of wild type, suggesting the 8% increase in message may arise from a slight relaxation of the maternal Dlk1 allele. The sequence-based Dlk1 imprinting assay is not quantitative, however, and this small degree of relaxation, if present, was not visible as an "A" peak greater than the background observed in wild type (Fig. 6B). In Gtl2Δ5'NeoMatB 6embryos, however, where Dlk1 expression is 127% of wild type, loss of Dlk1 imprinting was variably observed in the sequencing assay (Fig. 6B). Gtl2 imprinting was lost in Gtl2Δ5'NeoPat embryos (Fig. 6C), but was retained in Gtl2Δ5'NeoMat129 and Gtl2Δ5'NeoMatB 6embryos (Fig. 6D). These results are quite similar to those seen in Gtl2lacZ, with overexpression/loss of imprinting of the normally silent gene on the chromosome carrying the integration, and decreased expression of the normally active gene on that chromosome (Table 1). The effects of genetic background are also significant in Gtl2Δ5'Neo mice. Dlk1 - Gtl2 imprinting analysis in Gtl2Δ5'Neo embryos. A) Imprinting assay for Dlk1 in wild type (left) and Gtl2Δ5'NeoPat (right) embryos. B) Imprinting assay for Dlk1 in wild type (left), Gtl2Δ5'NeoMat129 (center) and Gtl2Δ5'NeoMatB 6(right) embryos. The Dlk1 polymorphism is an "A" in D embryos and a "G" in C embryos; the polymorphic base is boxed on each chromatogram. C) Imprinting assay for Gtl2 in Gtl2Δ5'NeoPat embryos. 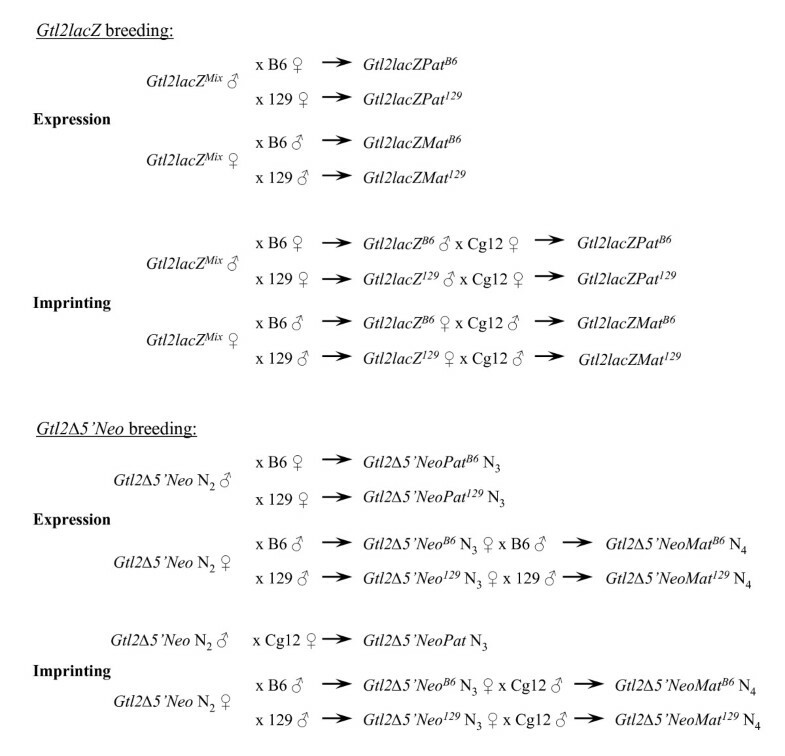 D) Imprinting assay for Gtl2 in Gtl2Δ5'NeoMat129 and Gtl2Δ5'NeoMatB 6embryos. The Gtl2 polymorphism alters an Sfc I restriction enzyme site, with the site present in D and absent in C; the D and C bands are indicated at the right. Excision of Neo from Gtl2Δ5'Neo mice was accomplished using a mouse strain that expresses Cre recombinase from the EIIa promoter, generating Gtl2Δ5' animals (Fig. 4A) . Gtl2Δ5' mice were bred as described for Gtl2Δ5'Neo, and offspring were analyzed for the expected paternal dwarfism. Surprisingly, animals inheriting the Gtl2Δ5' allele paternally (Gtl2Δ5'Pat) showed no dwarfism after crosses to either 129 or B6 females (data not shown). When Gtl2Δ5'Pat embryos were analyzed for expression and imprinting of Dlk1-Gtl2, both parameters were found to be wild type (data not shown). Mice inheriting the Gtl2Δ5' allele maternally (Gtl2Δ5'Mat), also showed no growth phenotype or change in the expression/imprinting of Dlk1-Gtl2 (data not shown). The dwarfism effect and loss of imprinting seen in the Gtl2Δ5'Neo mice therefore does not result from the genomic deletion, but is due to the presence of the Neo integration itself. The parallels between the Gtl2lacZ and Gtl2Δ5'Neo mice are striking. The presence of exogenous sequences upstream of the Gtl2 DMR, lacZ/β-actin-Neo at -1.7 kb in the Gtl2lacZ mice, and Pgk-Neo at -1.3 kb in the Gtl2Δ5'Neo mice, cause loss of imprinting of Dlk1-Gtl2 upon both paternal and maternal inheritance. These data add further evidence to the growing list of insertional Neo effects seen in transgenic and targeted mice, but more importantly, they suggest that insertional mutagenesis upstream of Gtl2 perturbs imprinting within the region. One mechanism by which the Gtl2lacZ and Gtl2Δ5'Neo integrations could alter imprinting is if they caused epigenetic changes at the adjacent Gtl2 DMR, which is normally methylated on the paternally inherited allele [1, 3, 28]. The methylation status of the Gtl2 DMR was therefore analyzed by Southern blotting in Gtl2Δ5'Neo and Gtl2Δ5' mice. Genomic DNA from midgestation embryos was digested with the enzyme Hinc II in combination with Msp I, which cuts both methylated and unmethylated DNA, or Hpa II, which cuts only unmethylated DNA (Fig. 7A). While digestion of the wild type allele gives a 2.2-kb Hinc II fragment, the Gtl2Δ5'Neo and Gtl2Δ5' alleles generate fragments of 3.8 kb and 3.5 kb, respectively, allowing allele-specific analysis of Gtl2 DMR methylation. Digestion of wild type DNAs with Hinc II/Hpa II shows that approximately 50% of the signal seen with Hinc II alone remains, representing the methylated paternal allele that is not cut by Hpa II (Fig. 7B). 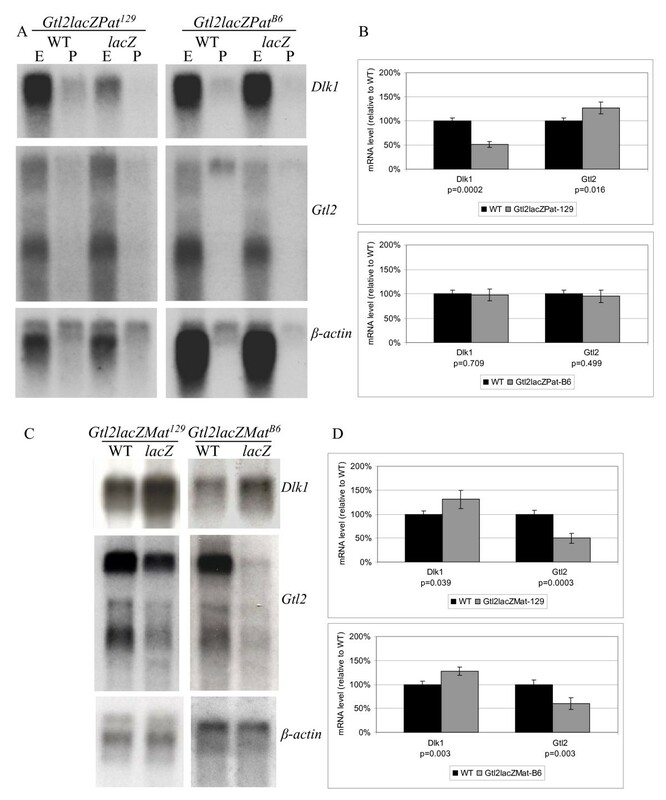 After Hinc II/Hpa II digestion of Gtl2Δ5'NeoPat129 or Gtl2Δ5'NeoPatB 6DNA, however, no signal remains for the mutant allele, indicating that the paternal Gtl2 DMR methylation is lost in Gtl2Δ5'NeoPat embryos (Fig. 7B and data not shown). Importantly, Neo excision restored paternal methylation of the Gtl2 DMR in Gtl2Δ5'Pat embryos. Loss of paternal Gtl2 DMR methylation was also seen in Gtl2lacZPat129 embryos, but not in Gtl2lacZPatB 6embryos (data not shown), in agreement with the fact that Gtl2lacZPatB 6mice do not display loss of imprinting. These data show that altered expression of Dlk1-Gtl2 is associated with loss of paternal methylation at the Gtl2 DMR. No change in methylation of the (normally unmethylated) maternal Gtl2 DMR was observed in any Gtl2Δ5'NeoMat (Fig. 7C) or Gtl2lacZMat embryos (data not shown). Methylation analysis of the Gtl2 DMR in Gtl2Δ5'NeoPat and Gtl2Δ5'Pat embryos. A) Schematic of the Gtl2 DMR region in wild type, Gtl2Δ5'Neo and Gtl2Δ5' alleles. The grey box represents the Gtl2Δ5' deletion region, the green box represents the Neo gene and the black box represents Gtl2 exon 1. The vertical arrows represent recognition sites for the Msp I/Hpa II restriction enzymes, and the loxP sites are indicated by black triangles. The methylation assay detects a 2.2-kb endogenous Hinc II fragment that spans the Gtl2 DMR. Modifications in the Gtl2Δ5'Neo and Gtl2Δ5' alleles generate 3.8-kb and 3.5-kb fragments, respectively. B) Methylation assay for the Gtl2 DMR in Gtl2Δ5'NeoPat129 and Gtl2Δ5'Pat129 embryos. C) Methylation assay for the Gtl2 DMR in Gtl2Δ5'NeoMat129 and Gtl2Δ5'Mat129 embryos. Restriction sites are, H, Hinc II, Hp, Hpa II and M, Msp I. The promoter of the Dlk1 gene is normally unmethylated on both parental alleles [1, 28]. The Dlk1 DMR located within the 3' region of the Dlk1 gene is partially methylated on the paternal allele, but unmethylated on the maternal allele . Since Dlk1 expression is decreased in Gtl2lacZPat129 mice, changes in methylation at the Dlk1 gene itself might be involved in this decrease. Southern analysis of the methylation status of both regions in Gtl2lacZPat129 embryos, however, showed them to be indistinguishable from wild type (data not shown). The IG DMR is believed to represent the gametic mark for the Dlk1-Gtl2 locus, although its functional role appears to be limited to the maternal chromosome [28, 29]. This region is normally paternally methylated and maternally unmethylated, and changes in this methylation might alter imprinting in the region. Southern analysis of IG DMR methylation in Gtl2lacZPat129 embryos, however, showed no changes from wild type (data not shown). The Gtl2 first intron contains a conserved recognition sequence for the CCCTC-binding factor (CTCF), a zinc finger protein shown to be a regulator of imprinting at several loci [2, 28, 31, 37–40]. This region carries largely paternal-specific methylation, and Southern blotting was used to assay for any changes in this pattern in Gtl2Δ5'Neo embryos. No differences in methylation of the CTCF-binding site region were observed between wild type and Gtl2Δ5'Neo or Gtl2Δ5' embryos (data not shown). Analysis of all known DMRs at the Dlk1-Gtl2 locus, therefore, shows that only changes in the Gtl2 DMR correlate with loss of imprinting. Although the lacZ gene within the Gtl2lacZ transgene lacks its own promoter, the gene is expressed beginning in early embryogenesis, either by read-through from the β-actin promoter of the adjacent Neo gene, or from a cryptic promoter within the transgene or upstream sequences . This expression is irrespective of parental inheritance, indicating that it is not expression of the transgene alone that confers the different paternal and maternal Gtl2lacZ effects. Rather it is likely that expression of the Gtl2lacZ transgene interacts with the specific imprinting machinery that controls each allele. RT-PCR analysis of Gtl2Δ5'NeoPat and Gtl2Δ5'NeoMat embryos showed that the Neo gene carried by this allele is also expressed after both maternal and paternal inheritance (data not shown). Imprinted genes are often subject to coregulation, in which a single regulatory element, or group of elements, controls multiple genes within a domain. At the Igf2-H19 locus, for example, there are shared regulatory elements for both expression and imprinting [41, 42]. At the Dlk1-Gtl2 locus, the Callipyge (CLPG) sheep mutation results in overexpression of at least four linked genes in skeletal muscle (DLK1, GTL2, PEG11 and MEG8), with no effect on their imprinting . This suggests that the CLPG mutation activates an enhancer (or inactivates a repressor) for skeletal muscle expression of these genes. This mutation has been localized to a position between the Dlk1 and Gtl2 genes, near to, but distinct from, the IG-DMR . The function of the IG-DMR, which regulates maternal chromosome imprinting of multiple genes in the domain, also suggests co-regulation . Since the Gtl2lacZ and Gtl2Δ5'Neo mutations cause a loss of imprinting of both Dlk1 and Gtl2, it was possible they also deregulate other genes in the cluster. To address this question, imprinting assays were developed for the Meg8 and Rian genes located distal to Gtl2 (Fig. 1A). The Meg8 gene is maternally expressed in sheep, and is believed to produce a noncoding RNA . The Rian gene is maternally expressed in the mouse, and produces a series of C/D snoRNAs [10, 11]. These genes were analyzed separately in this work, but it is likely they represent alternately spliced forms of a single primary transcript (Kalinina & Schmidt, unpublished). The Meg8 imprinting assay utilizes an Nla III restriction polymorphism, with the site present in C mice and absent in D mice. A second Nla III site in the amplified PCR product results in a pattern of three fragments for the C allele, and two fragments for the D allele. The Rian imprinting assay detects a Hinf I polymorphism, with the site present in D mice and absent in C mice. 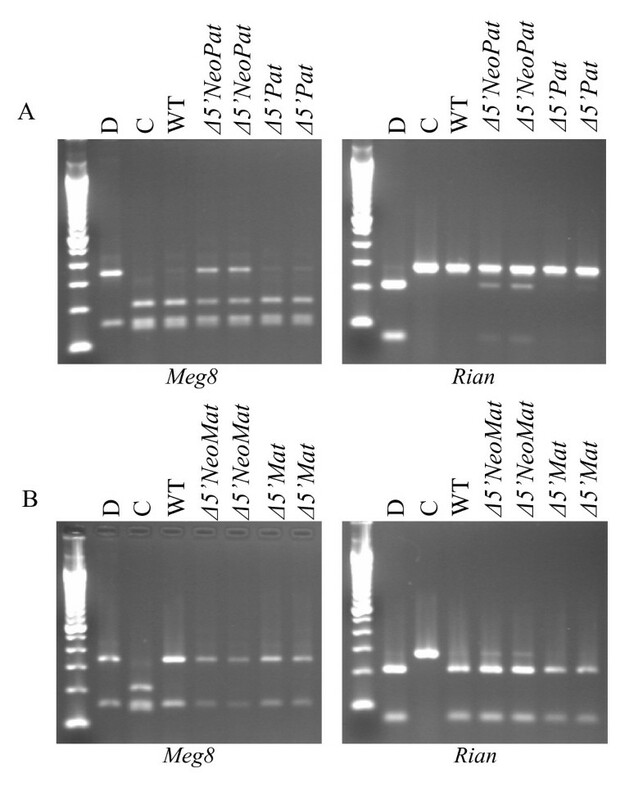 After crosses to Cg12 mice, Gtl2Δ5'NeoPat129 embryos showed biallelic expression of both Meg8 and Rian, indicating activation of the normally silent paternal alleles of these genes (Fig. 8A). Gtl2Δ5'NeoMat129 embryos did not show loss of imprinting of either Meg8 or Rian (Fig. 8B). Attempts to analyze the imprinting of the Rtl1/αRtl1 genes in Gtl2Δ5'Neo mice have so far proven impossible, as there are no sequence polymorphisms in these genes between D and C mice. Meg8 / Rian imprinting analysis in Gtl2Δ5'Neo embryos. A) Imprinting assay for the Meg8 (left) and Rian (right) genes in Gtl2Δ5'NeoPat129 and Gtl2Δ5'Pat129 embryos. B) Imprinting assay for the Meg8 (left) and Rian (right) genes in Gtl2Δ5'NeoMat129 and Gtl2Δ5'Mat129 embryos. The Meg8 imprinting assay detects an Nla III polymorphism, with the site present in C mice and absent in D mice. The Rian imprinting assay detects a Hinf I polymorphism, with the site present in D mice, and absent in C mice. The data presented here document the molecular characterization of two mouse lines with insertional mutations upstream of the Gtl2 gene. Gtl2lacZ mice carry a 15-kb insertion containing multiple copies of a promoterless-lacZ/β-actin-Neo gene trap vector. Gtl2Δ5'Neo animals have a 2.8-kb endogenous deletion that is replaced by a 1.9-kb Pgk-Neo cassette. Both integrations contain bacterial DNA including the Neo gene, and both Neo genes are under the control of constitutive promoters. There are key differences in the two integrations, however, including the size of the insertion, the specific promoters used, and the deletion of endogenous sequence. The integrated reporter genes are both transcribed but in opposite directions, with the Gtl2lacZ transgene transcribed towards Dlk1, and the Gtl2Δ5'Neo transgene transcribed towards Gtl2. Despite these differences, Gtl2lacZ and Gtl2Δ5'Neo mice show similar phenotypes. Both mutations cause partial neonatal lethality upon paternal inheritance, with dwarfism of surviving mice, and changes in expression and imprinting of linked genes after paternal and maternal inheritance. The mechanism of action is therefore likely to be the same in both lines. The integrations themselves are causative for these effects, rather than deletion of endogenous sequence, since excision of the Neo cassette from the Gtl2Δ5'Neo allele restores a normal phenotype. While this work was in progress, another group also reported data on the loss of imprinting in Gtl2lacZ mice . The results from this work are largely consistent with those presented here, but there are some differences as well. Sekita et al also observe a 50% reduction in Dlk1 RNA levels after paternal inheritance of the Gtl2lacZ mutation, and show that Dlk1 imprinting is maintained in these mice. The data presented here, however, report a concomitant increase in the levels of Gtl2 RNA to 127% of wild-type, with biallelic expression, while Sekita reports no change in Gtl2 levels. These authors do see biallelic expression of Gtl2, however, indicating that there is activation of the paternal Gtl2 allele in their mice, but perhaps not to a level measurable by the assays used. After maternal Gtl2lacZ inheritance, the data presented here show decreased Gtl2 RNA levels to 50–60% of wild type with no loss of imprinting, and an increase in Dlk1 RNA to ~130% of wild type with biallelic expression. Sekita et al observe levels of Gtl2 decreased to 20–40% of wild type with no loss of imprinting, but report no changes in Dlk1 expression or imprinting. Both groups report a complete loss of DNA methylation on the paternal Gtl2 DMR after paternal inheritance of the Gtl2lacZ mutation. While the basis for these largely quantitative differences is not known, it is likely that different genetic backgrounds, and/or different assay techniques are responsible. The biallelic expression of Gtl2 observed in Gtl2lacZPat and Gtl2Δ5'NeoPat animals may result from loss of paternal-specific methylation at the Gtl2 DMR. Methylation is a key regulator of genomic imprinting, and the position of the Gtl2 DMR suggests it could directly silence the paternal Gtl2 allele. Other work from our laboratory has demonstrated that the loss of Gtl2 DMR methylation in Gtl2Δ5'NeoPat mice is also correlated with increased histone acetylation at the paternal Gtl2 DMR (Carr et al, submitted). While additional changes to unknown regulatory regions cannot be ruled out, all other Dlk1-Gtl2 DMRs are unaltered with regard to methylation and chromatin structure. The maternally expressed Meg8/Rian genes lie more than 70 kb from the Gtl2 DMR, suggesting a more complicated mechanism than direct silencing would need to exist, perhaps a long-range, methylation-dependent silencer within the Gtl2 DMR. It should be noted, however, that since the methylation of the Gtl2 DMR occurs post-fertilization, this modification may not be involved in initiating the silencing of the paternal Gtl2 allele, but only in maintenance of the silent state. Additionally, it is possible that the Gtl2 integration prevents paternal Gtl2 silencing by a mechanism unrelated to the loss of DMR methylation, with the lack of methylation being secondary to continued expression of the paternal Gtl2 allele. Hypermethylation of integrated transgenes in the mouse is common, and this methylation frequently spreads into surrounding endogenous sequences . The causative sequences are usually bacterial or viral, and are targeted by the cellular methylation machinery because of their resemblance to endogenous retroviral elements, and/or their tendency to integrate in repetitive arrays. The Gtl2lacZ and Gtl2Δ5'Neo integrations, however, prevent the methylation of a normally methylated endogenous sequence. Possible mechanisms for this effect are discussed below. The Gtl2lacZ and Gtl2Δ5'Neo mutations are modified by genetic background, with Gtl2lacZPat exhibiting a phenotype only in crosses to 129 females, while the Gtl2Δ5'NeoPat mutation shows an effect in both 129 and B6 crosses. The changes in gene expression and imprinting in Gtl2lacZPat and Gtl2Δ5'NeoPat mice correlate with altered methylation at the Gtl2 DMR, and may therefore be due to strain-specific modifiers of DMR methylation. Parental- and strain-specific differences in transgene methylation are well documented [47–50]. A troponin transgene, for example, is methylated in the mouse when passed maternally, but is fully or partially unmethylated when passed paternally . This variation in methylation is largely dependent on the genetic background of the non-transgenic female that is crossed to the transgenic male. This is reminiscent of the ability of a single cross to a 129 or B6 female to modify the effects of the Gtl2lacZPat and Gtl2Δ5'NeoPat mutations. In general, the B6 strain has been shown to be more highly methylating than are 129 strains. The normal phenotype of Gtl2lacZPatB 6mice might therefore result from a greater ability of this high-methylating background to accomplish Gtl2 DMR methylation despite the presence of the integration. The fact that the Gtl2Δ5'NeoPatB 6mutation produces a phenotype, however, indicates that these strain-dependent modifiers affect the two integrations differently. The question remains how the presence of the Gtl2lacZ and Gtl2Δ5'Neo integrations prevent paternal methylation of the Gtl2 DMR. Several possibilities must be considered. First, it is possible the integrations physically disrupt a regulatory element that directs methylation. However, the observation that a deletion of this region has no effect (Gtl2Δ5') suggests that this is not the case. Second, the integrations may have altered the relative positioning of an upstream element that controls Gtl2 DMR methylation. The 15-kb Gtl2lacZ integration might move a Gtl2 methylating element too far away from the Gtl2 DMR for proper function. The deletion associated with the Gtl2Δ5'Neo mutation, however, brings the Gtl2 upstream sequence 0.9 kb closer to the Gtl2 DMR than in wild type animals. A third possibility is that transcriptional interference from the expressed lacZ/β-actin-Neo and Pgk1-Neo genes might interfere with the ability of DNA methyltransferase to establish a silent paternal chromatin structure within this region. 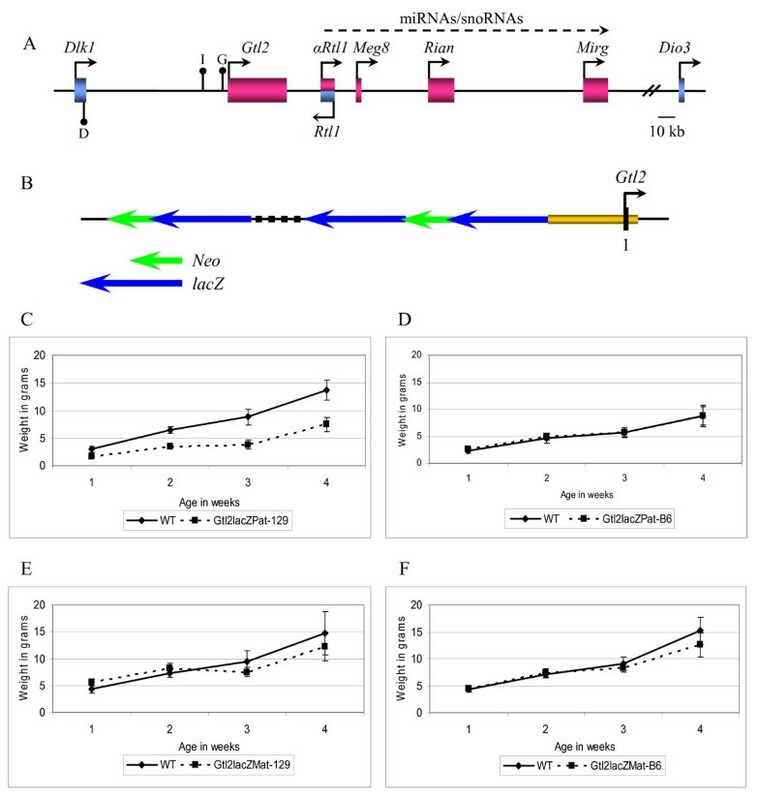 Transcription from the Gtl2Δ5'Neo integration through the Gtl2 DMR might prevent the binding of factors that initiate or maintain methylation of the paternal Gtl2 DMR. This argument is complicated by the fact that the Gtl2lacZ transgene is transcribed away from the Gtl2 DMR, but recent work has shown that transcriptional interference can occur between adjacent promoters organized in all possible directional combinations . Further studies of the Gtl2 DMR and upstream region will be necessary to define the requirements for proper methylation. Interestingly, a genomic element has been identified that can protect both a transgene, and adjacent endogenous sequences, from genomic methylation . This IE (island element) was identified within the Aprt gene, but can also protect heterologous sequences within the context of an integrated mouse transgene. While the mechanism of IE function is not known, this element appears to function during the wave of de novo methylation that occurs at implantation, as IE deletion beyond this point has no effect. One possible explanation for the loss of Gtl2 DMR methylation would be a similar type of element present within the Gtl2lacZ and Gtl2Δ5'Neo transgenes. Biallelic Dlk1 expression in the Gtl2lacZMat and Gtl2Δ5'NeoMat animals suggests that these animal models may also provide information about the mechanism by which the maternal Dlk1 allele is silenced. A number of possibilities can be suggested for why Dlk1 imprinting is lost, and these models may function alone or in combination. First, a model has been proposed in which the maternally expressed noncoding RNAs at the Dlk1-Gtl2 locus act to silence Dlk1 posttranscriptionally [54, 55]. If this model is proven to be true, the decreased levels of Gtl2, and presumably other maternal noncoding RNAs, found in the Gtl2lacZMat and Gtl2Δ5'NeoMat mice might allow for increased levels of Dlk1. The model as proposed allows only for regulation in trans, however, while the Gtl2lacZ and Gtl2Δ5'Neo model systems show activation of Dlk1 in cis to the mutation. Second, it is possible that the Gtl2 DMR itself has a role in silencing the maternal Dlk1 allele. The maternal Gtl2 DMR is not normally methylated, and does not acquire methylation in the Gtl2lacZMat and Gtl2Δ5'NeoMat animals, so it would have to function by another mechanism. One manner in which this region might promote Gtl2 transcription, while silencing Dlk1, would be if it carried a strong enhancer that preferentially interacted with the Gtl2 promoter. Methylation of the DMR would inactivate this enhancer paternally, and the Gtl2lacZ and Gtl2Δ5'Neo integrations might alter its structure. Similarly, the region might contain a long-range repressor specific for the Dlk1 gene. Lastly, the integrations might act by altering chromatin structure over a larger genomic region, disrupting a chromatin conformation that favors Gtl2 expression and Dlk1 silencing. Activation of the normally silent allele of Dlk1 or Gtl2, on a given chromosome, results in decreased expression of the normally active gene on that chromosome. This is reminiscent of effects seen at Igf2-H19, where activation of both genes on a single chromosome leads to expression at levels less than wild type, likely due to competition for shared enhancers . The locations of the enhancers that regulate tissue-specific Dlk1-Gtl2 expression are largely unknown, but the genes are coexpressed in many neuroendocrine cell types. The reciprocal changes in gene expression seen after loss of Dlk1-Gtl2 imprinting suggest that the Dlk1 and Gtl2 genes may share common enhancers for those tissues in which they are coexpressed. The neonatal lethality and dwarfism of the Gtl2lacZPat and Gtl2Δ5'NeoPat mice are similar to mice carrying a paternal deletion of the Dlk1 gene, although Dlk1 null mice also show skeletal, adipose and eye defects . These data suggest that it is likely to be the decreased level of Dlk1 in the Gtl2lacZPat and Gtl2Δ5'NeoPat animals that is the cause of their lethality and dwarfism. The proportionate dwarfism of the Gtl2lacZPat, Gtl2Δ5'NeoPat and Dlk1 null mice is reminiscent of animals with reduced levels of growth hormone, and there is evidence for interactions between the Dlk1 and GH pathways [56–59]. Gtl2lacZPat and Gtl2Δ5'NeoPat mice may not display the other effects seen in Dlk1 null mice because Dlk1 in these animals is only decreased, not absent, and growth may be the most sensitive indicator of Dlk1 levels. It is notable that those animals which show the most severe phenotype, Gtl2Δ5'NeoPatB 6, also show the lowest levels of Dlk1. The Gtl2lacZPat and Gtl2Δ5'NeoPat animals also show loss of imprinting of Gtl2 and Meg8/Rian, and it cannot be ruled out that changes in the levels of these transcripts are causative for the dwarfism. Neither of these transcripts produces a protein, however, and they have not been shown to have any physiological role. If Dlk1 functions as a growth factor, it might be expected that overexpression of Dlk1 would confer an overgrowth phenotype. Gtl2Δ5'NeoMat129 mice show levels of Dlk1 up to 131% of wild type, yet no overgrowth is detected in these animals. The generation of transgenic animals expressing greater levels of Dlk1 will be required to determine the effects of overexpression of this gene. The work presented here demonstrates that the integration of exogenous DNA sequences upstream of the Gtl2 DMR, at -1.7 kb in the Gtl2lacZ mutation and -1.3 kb in the Gtl2Δ5'Neo mutation, causes loss of imprinting and altered expression of Dlk1 and Gtl2. Mice inheriting either mutation paternally show partial neonatal lethality and dwarfism of surviving animals, a phenotype that may be due to the decreased levels of Dlk1 found in these mice. Both models also show a loss of the paternal-specific methylation at the Gtl2 DMR in cis to the mutation. Animals in which the Gtl2Δ5'Neo selectable marker is removed using Cre recombinase are indistinguishable from wild type, indicating that it is the presence of the integrated DNA causing the mutant phenotypes. These studies present further evidence for the coregulation of the Dlk1 and Gtl2 genes, and support a role for Dlk1 as an important neonatal growth factor. The loss of Gtl2 DMR methylation is particularly intriguing; in future experiments it will be important to define what role this region may play in imprinting regulation. The Gtl2lacZ mice were obtained on a B6 × 129 × BALB/c background, and were maintained on a B6 × 129 background by alternating breeding partners at each generation. Gtl2lacZ mice were genotyped by PCR using primers that detect the full-length lacZ-Neo integration, as well as a spontaneously occurring internal deletion . Although the phenotype of animals with the full and deleted integrations display similar phenotypes, only mice with the full insertion were analyzed. The genotyping primers were: Gtl2lacZ3, 5'-CAACTTAATCGCCTTGCAGC-3' with Gtl2lacZ4, 5'-CCAGATAACTGCCGTCACTCC-3', which detect the full transgene; and Gtl2trlacZ, 5'-AGCCACAGACGTCATTATGC-3' with Gtl2lacZ4, which detect the deleted integration. PCR conditions were 94°C, 1 min, 62°C, 1 min, 72°C, 1 min, for 35 cycles. Full details of all breeding strategies for the mice analyzed in this work are given in Figure 9. The Gtl2Δ5'Neo targeting construct was generated using the vector ploxPNT, which carries a Neomycin resistance gene flanked by loxP sites. Genomic DNA was isolated from the RPCI-22 BAC clone 28G5. The 5' arm was a 1.4-kb Eco RI-Bgl II fragment spanning the region from -5516 to -4094 bp relative to the Gtl2 transcriptional initiation site, and the 3' arm was a 6.0-kb Nae I-Eco RI fragment spanning the region from -1348 to +4608 bp. The targeting construct was linearized and transfected into E14 embryonic stem (ES) cells using a Bio-Rad GenePulser at 250 V/500 μF. Transfected ES cells were subjected to selection in G418, and clones picked to 96 well plates for analysis . 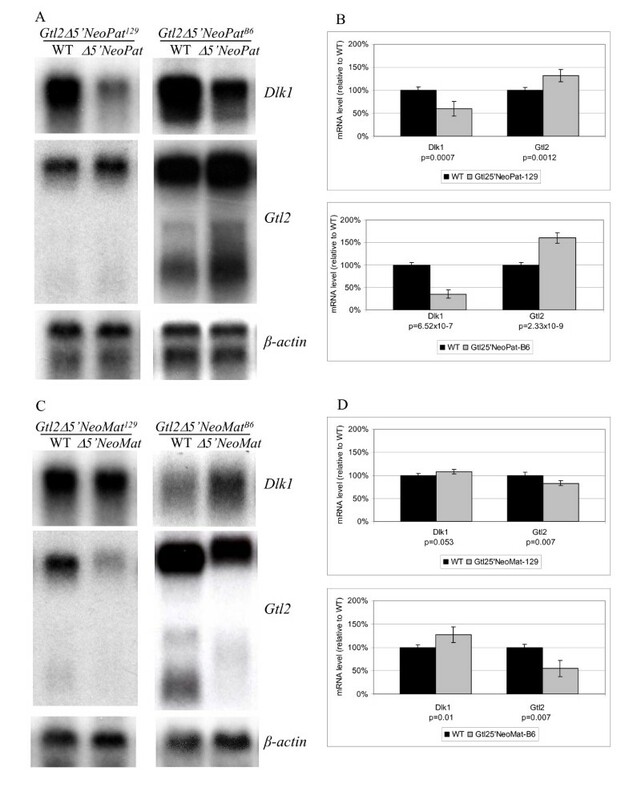 ES cell DNAs were analyzed by Southern blotting using either Bst EII or Kpn I digests, and hybridized with a PCR generated probe corresponding to nucleotides -5401 to -6394 relative to Gtl2 (primers OL306, 5'-ACTCTTCTCTCTCCAATGGCAAG-3', and OL307, 5'-CATTCAACTGCCTACAGTTAGGGAG-3'). The Bst EII digest detects a 6.6-kb band in wild type ES cells and a 5.7-kb band in properly targeted ES cells; the Kpn I digest detects 4.2-kb wild type and 7.2-kb targeted bands. Cells from correctly targeted ES clones were injected into B6 blastocysts by the UIC Transgenic Production Service, and the blastocysts implanted in pseudopregnant ICR females. Resulting chimeras were bred to B6 mice to assay for germline transmission of the targeted allele, and N1 animals crossed to B6 to give N2 mice. 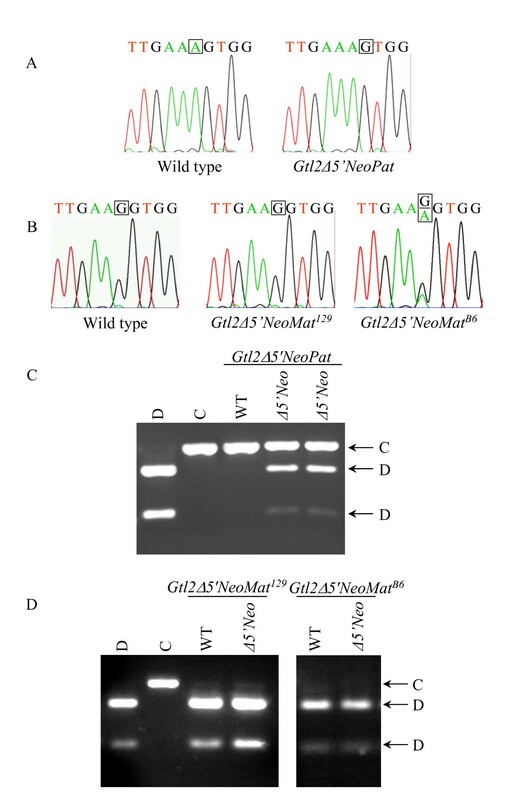 During maintenance and analysis, Gtl2Δ5'Neo mice were genotyped using a forward primer upstream of the deletion, and a reverse primer in the Neo gene. The forward primer was OL521, 5'-GCGATTACCCTTGGGTTACTGC-3' and the reverse primer was OL708, 5'-AACTTCTGACTAGGGGAGGAG-3'. PCR conditions were 95°C, 1 min, 57°C, 40 sec and 72°C, 40 sec, for 35 cycles. The Neo cassette was removed by crossing Gtl2Δ5'Neo males to EIIa-Cre females (Jackson Labs, B6.FVB-Tg(EIIa-Cre)C5379 Lmgd/J) . EIIa-Cre mice often give mosaic excision in the F1 offspring, a result of Cre activation after the first cleavage division. DNA was isolated from tail biopsies of progeny and genotyped using the OL521/OL708 PCR assay described above, and also with primers OL521 and OL285, 5'-TAGGATGCCACTGTGACTCGG-3', which detect the excised allele. PCR conditions were 95°C, 1 min, 59°C, 40 sec and 72°C, 40 sec, for 35 cycles. Mice showing only the excised allele by tail DNA PCR were verified by a test breeding to ensure they passed only the Gtl2Δ5' allele. Genomic DNA was extracted using proteinase K digestion and phenol:chloroform extraction. For Southern blotting, 10 μg of DNA was digested with the appropriate restriction enzyme(s), separated on 1× TAE agarose gels, and transferred to Hybond N+ membranes (GE Healthcare). Membranes were incubated in hybridization buffer (5× SSPE, 0.5% SDS, 5× Denhardt's solution, 50 ng/ml salmon sperm DNA) overnight at 65°C. Washing conditions were: twice in 2× SSPE, 0.1% SDS, once in 1× SSPE, 0.1% SDS, and once in 0.1× SSPE, 0.1% SDS, all at 65°C. Membranes were exposed to X-ray film at -80°C with an intensifying screen. For methylation analysis of the Gtl2 DMR, DNA was digested with Hinc II in combination with Msp I or Hpa II, and hybridized with a 532-bp Sac I-Xho I fragment spanning nucleotides +19 to +551 of the Gtl2 gene. Total RNA was extracted from embryos using TRIzol reagent (Invitrogen). Ten micrograms of total RNA was separated on 1% formaldehyde-MES agarose gels, blotted to Hybond N+ membranes (GE Healthcare) and hybridized with Express-Hyb solution (Clontech) for 1 hr at 65°C. Membranes were hybridized with the following probes: Dlk1, a 735-bp PCR-generated fragment corresponding to nucleotides 685 to 1420 of the Dlk1 transcript; Gtl2, a 368-bp PCR-generated fragment spanning nucleotides 1482 to 1850 of the Gtl2 transcript; and a 1.2-kb fragment of the mouse β-actin gene. Membrane washes were: three times in 2× SSC, 0.05% SDS, and twice in 0.1× SSC, 0.1% SDS, all at 50°C. Signal intensity was quantified by Phosphor imaging, and Dlk1 and Gtl2 levels were normalized to the expression of β-actin. Gtl2lacZ and Gtl2Δ5'Neo animals were analyzed from e12.5 to e17.5; temporal variation in gene expression levels were seen across this time period, particularly for β-actin, but relative changes in expression between wild type and mutant animals did not vary with gestational age. Allele-specific expression of the Dlk1 and Gtl2 genes was analyzed using previously described single nucleotide polymorphisms between the M. m. domesticus (D) allele carried by 129 and B6 mice, and the M. m. castaneus (C) allele carried by the Cg12 congenic line . For RT-PCR analysis, 2 μg of total RNA was reverse transcribed using Superscript III (Invitrogen), RT reactions were diluted 1:10, and 2 μl was used for PCR amplification. In all imprinting analyses, control reactions in the absence of reverse transcriptase were negative. Dlk1 imprinting analysis involves RT-PCR followed by direct sequencing of a 288-bp fragment of the 3' region of the Dlk1 transcript. This assay detects an A/G polymorphism, with the A allele present in D mice and the G allele present in C mice. Gtl2 imprinting analysis involves RT-PCR followed by digestion with the restriction enzyme Sfc I, with the site present in D mice and absent in C mice. The Meg8 imprinting assay examines a polymorphic Nla III restriction site using primers designed against the mouse genomic sequence homologous to that reported for ovine Meg8 . Primers were OL552, 5'-TAAGTAATTGCTGAGTGCCTTG-3' and OL553, 5'-TCAGTTGAGCTGGATCACATTA-3'. PCR conditions were 94°C, 30 sec, 55°C, 30 sec and 72°C, 1 min for 33 cycles. The resulting product is 495 bp, and Nla III digestion of the D allele generates two fragments of 151 and 344 bp each, while the C allele yields three fragments of 151 bp, 207 bp, and 137 bp. The Rian imprinting assay detects a polymorphic Hinf I restriction site using primers designed against the GenBank sequence AK017440. Primers were OL596, 5'-GACTCATAGTTCTTTGTCTGGG-3' and OL595, 5'-GTGAAAGGCTGAAGGAGCTG-3'. PCR conditions were 94°C, 30 sec, 56°C, 30 sec and 72°C, 45 sec, for 29 cycles. The resulting product is 281 bp long, and Hinf I cuts the B6 allele, yielding fragments of 68 bp and 213 bp. The authors thank Achim Gossler (Medizinische Hochschule Hannover) for the Gtl2lacZ mice, and Teresa Orenic for a critical reading of the manuscript. This work was supported by a Kimmel Scholar Award from the Sidney Kimmel Foundation for Cancer Research, and by grant HD042013 from the National Institutes of Health, both to JVS. All animals used in these experiments were maintained in compliance with the National Institutes of Health's Guide for the Care and Use of Laboratory Animals and The University of Illinois at Chicago Animal Care Committee guidelines. ES performed the breeding and analysis of the Gtl2lacZ, Gtl2Δ5'Neo and Gtl2Δ5' mice, and assisted with the writing of the manuscript; MC and OA assisted with the breeding and analysis of the Gtl2Δ5'Neo mice; EG performed the imprinting analysis of Meg8 and Rian; AY assisted in the DNA methylation analysis; JS conceived of the project, designed the experiments, performed the Gtl2Δ5' targeting and wrote the manuscript. All authors approved the final version of the manuscript.